The patient is a 19-year-old male with a past medical history of a repaired ventricular septal defect (VSD) and cardiac arrhythmia who presents with shortness of breath. He underwent VSD repair at 17 months and again at 5 years old. There is a questionable history of an aortic root aneurysm. 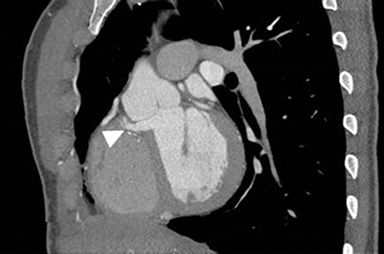 The patient underwent a transthoracic echocardiogram revealing a normal ejection fraction without evidence of a VSD. 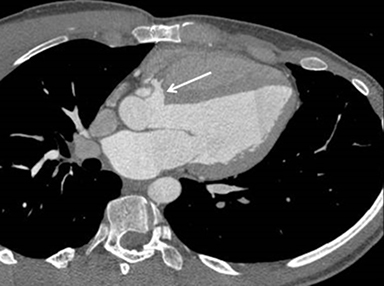 An EKG-gated cardiac CT was ordered to evaluate the aortic root. EKG gated dose modulated 128 slice helical CT images of the heart were obtained with optimal opacification of the left sided cardiac chambers and the aorta. Reformatted images were obtained in the coronal, sagittal, septal, three-chamber, and four-chamber planes. The images demonstrate focal anterior outpouching of the membranous portion of the interventricular septum, into the right ventricle, just caudal to the right coronary cusp measuring 1.7 cm by 2.6 cm by 1.2 cm. No thrombus is present. No defect is seen in the muscular portion of the interventricular septum. No aortic root aneurysm is seen. Mild ectasia of the sinus of Valsalva (measuring up to 4 cm in diameter) and a patent foramen ovale were also noted. These are not shown on the single images. Aneurysm of the membranous interventricular septum. Differential diagnosis includes sinus of Valsalva aneurysm, muscular ventricular septum aneurysm, membranous ventricular septal defect. The interventricular septum has two morphological components: the muscular and membranous portion. The majority of the interventricular septum is thick and muscular and constitutes the muscular interventricular septum. In contrast, the membranous interventricular septum is thin and fibrous, and is located at the upper posterior part of the interventricular septum, separating the aortic vestibule from the lower part of the right atrium and upper part of the right ventricle. A membranous interventricular septal aneurysm is a rare congenital abnormality.1 Most of these are found incidentally. The most common occurrence for the aneurysm is anteriorly, below the level of the aortic valve (membranous portion).2 Careful attention should be paid to exclude an aneurysm of the sinus of Valsalva in these cases. Membranous interventricular septal aneurysms have been associated with ventricular septal defects and outflow abnormalities, such as transposition of the great vessels.3,4 Even though these patients are often asymptomatic, they can be a source of arrhythmias or thrombus formation.5 The aneurysms can also protrude into the outflow tract of the right ventricle, resulting in obstruction.1 Transthoracic echocardiogram as a method of diagnosis is limited. Transesophageal echocardiogram and cardiac angiogram are invasive procedures that can help in the diagnosis. 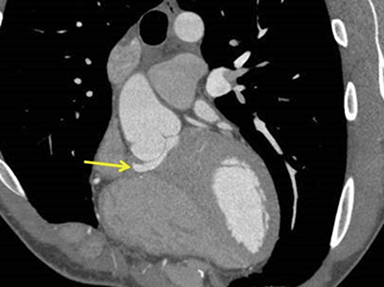 EKG-gated cardiac CT exams provide valuable multi-planar reconstructions with one imaging sequence acquisition, providing high-resolution anatomic detail. Also, 3-D reformation can easily be obtained from the CT data-set. Although aneurysm of the membranous interventricular septum is a rare entity, it should be recognized due to the potential complications. The use of EKG-gated multi-detector cardiac CT imaging offers high-resolution anatomical detail, which allows for improved visualization and diagnosis in cardiac pathology. Jain A, and Rosenthal R. Aneurysm of the membranous ventricular septum. British Heart Journal. 1967;29:60-63. Hudson C, and Hudson J. The interventricular septum: Measurement and motion. Anesthesia and Analgesia. 2013;(116)4:788-792. Shambrook JS, Chowdhury R, Brown IW, Peebles CR, Harden SP. Cross-sectional imaging appearances of cardiac aneurysms. Clinical Radiology. 2010;(65)5:349-357. Gunawan A, Krajcer Z, Leachman RD. Aneurysm of the membranous septum causing outflow obstruction of the venous ventricle in corrected transposition of the great arteries. Texas Heart Institute Journal. 1982.9:91-95. Carcano C, Kanne JP, Kirsch J. Interventricular membranous septal aneurysm: CT and MR manifestations. Insights Imaging. 2016;7:111-117. Bourm KS, McIntyre S, Joshi A, Shaheen WH. Aneurysm of the membranous interventricular septum. Appl Radiol. 2017;46(4):26-27. Prepared by Dr. Bourm while a second year Radiology Resident and Dr. McIntyre while a fourth-year Radiology Resident at the University of Kansas-Wichita at Wesley Medical Center; Dr. Joshi while an Assistant Clinical Professor and Radiologist at Wichita Radiology Group, Wesley Medical Center; and Dr. Shaheen while an Assistant Clinical Professor, Subspecialty Education Coordinator, and Interventional Cardiologist at Heartland Cardiology, Wichita, KA.